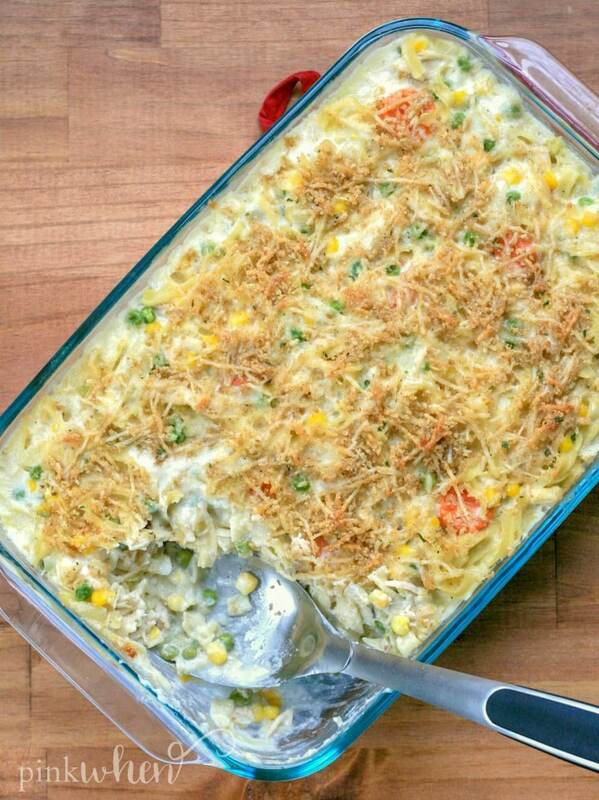 A creamy chicken noodle casserole dish is sure to please everyone at the table. This easy chicken bake is always one of my favorite chicken casserole recipes to make. 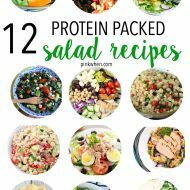 We love to add it to our monthly meal plan. 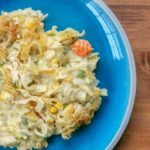 It’s made with scrumptious vegetables, chicken, noodles, and cheese. AND it’s done in 30 minutes. 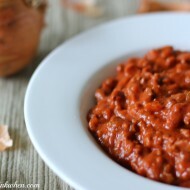 I love comfort food like this, and I love that it’s a quick and easy meal to make. If you love a creamy chicken casserole that’s quick and easy, you will love this dish. I don’t know about where you live, but the flu has been RAMPANT around here lately. I continuously daydream that this epidemic is the start of the zombie apocalypse. Just walk into your local pharmacy and stare at everyone waiting on their flu medications. It’s NASTY. First, it was my dad, then my mom (and she got it TWICE), then the youngest, and I finally succumbed to the realization that I was going to get it after taking care of her all week long. And then it happened. I got the flu. And that was two months ago, and weirdly enough, the flu is making the SECOND round in our area. I have my hand sanitizers everywhere! But let’s get back to this recipe. One thing that makes me feel better when I am feeling sick is a great big bowl of this delicious and creamy chicken casserole. It’s just one of those recipes that are not only delicious, but much needed in that time when you are feeling ill. And when I have the flu, I am IN NEED of some comfort food. What’s so good about having a casserole rather than soup? It’s filling! Not that I wanted to eat a ton of food when I was sick, but this stuck with me longer than any soup. And Chicken Noodle anything is just right for the soul. 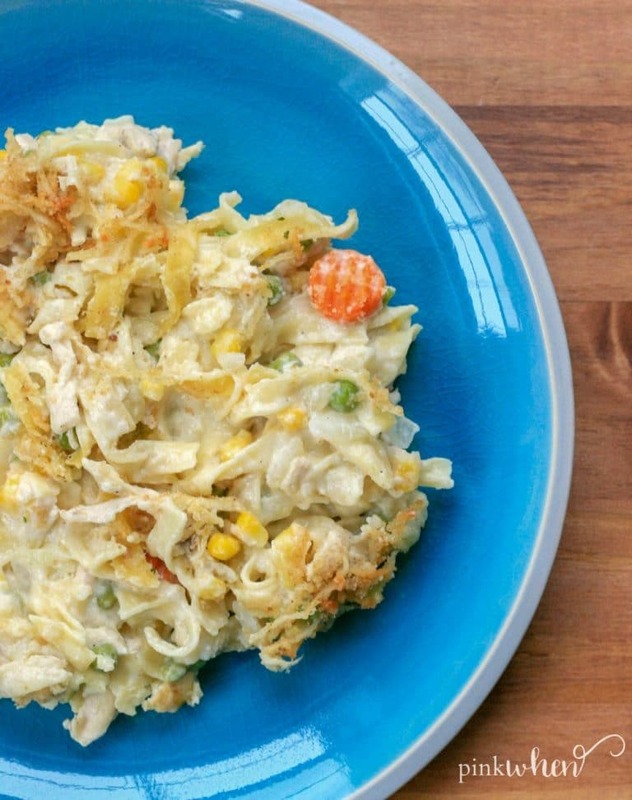 What’s the best part about this Chicken Noodle Casserole? What’s the best part about this recipe? 1. It’s easy to make. 2. It tastes amazing. 3. It is quick and easy. 4. It’s yummy chicken with a creamy sauce, enough said! If you have been on the blog before then you know I am a huge fan of chicken recipes. I swear I have more recipes with chicken than I have desserts. It’s almost like a game with this one ingredient of chicken…how many ways can I make it? Not to mention, (well I already did say it) but this recipe is straightforward to make. Just grab all of your ingredients and start cooking! It’s such a fantastic recipe, and it’s so full of flavor. If you are meal planning and looking for something delicious to place on the table this week, grab this yummy chicken casserole recipe. Besides, you can never have too many good casseroles on hand. It’s always nice to be able to serve a quick baked dish. Another quick tip for this chicken noodle casserole dish is that you can saute the onion in butter versus olive oil. It will make for an even creamier version! Not only that, but something about egg noddles and the butter flavor makes this even tastier. I hope you and your family were able to steer clear from the flu this season. If not, take heart. 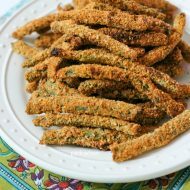 Stay at home and stay warm and comfy, and keep good recipes on hand like this one. I love a good chicken bake, and this is a simple one to make. You might also like this easy cheesy chicken casserole, these sweet chicken chili meatballs, or this southwest cheesy chicken casserole. We also have a fantastic chicken enchiladas recipe you might want to try. Want to see more chicken casserole recipes? Leave a comment below! 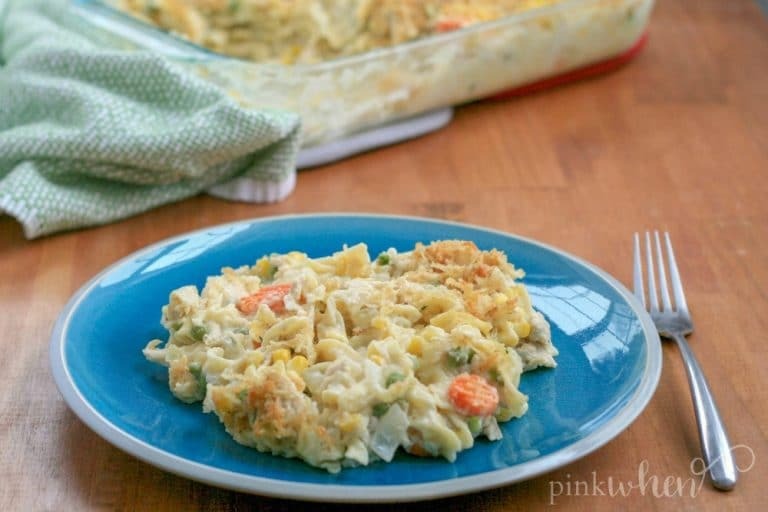 Better than soup, this Chicken Noodle Casserole is comfort food at it's best!